Soon after joining Fornebu three years ago, Godin put a plan in place to replace the aging equipment in the fleet. When he began the RFP process, SENNEBOGEN was an after-thought because he wasn’t familiar with the brand. But during the demo-phase, the SENNEBOGEN 830 material handler went from last to first on Godin’s list. The more he learned from Strongco about the machine’s easy-maintenance design, its robust reliability and safety, the higher it rose in his estimation. Godin says his strong mechanical background helped him assess the structural integrity of the machines as well as the relative ease of maintenance. “The way they designed the machine, it’s very, very tough. The unique shape of the frame is stronger than what any other machine has,” he says. Godin was so impressed with the quality and reliability of the 830 that he bought a second SENNEBOGEN. It is a purpose-built SENNEBOGEN 830 M-T wheeled material handler equipped with a logging grapple. The new SENNEBOGEN has all the advantages of the first one, including an attachment capacity that’s 50% larger than the material handler it replaced. 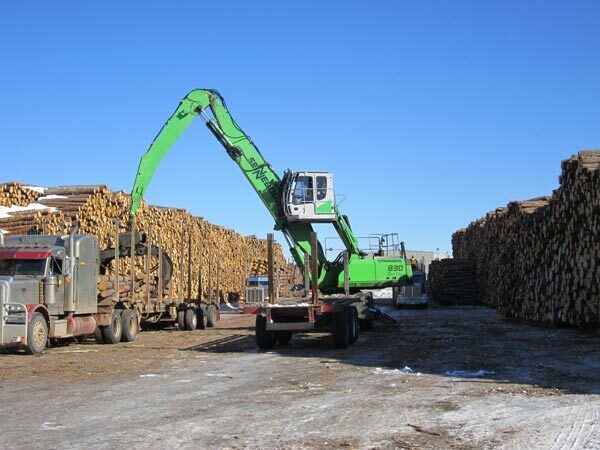 The SENNEBOGEN 830 M-T can handle 1.5 cords of wood in one scoop, requiring more power and more stability. The 830 M-T has no trouble stacking 3,000 lb (1,361 kg) loads higher than the other machines he compared it to. 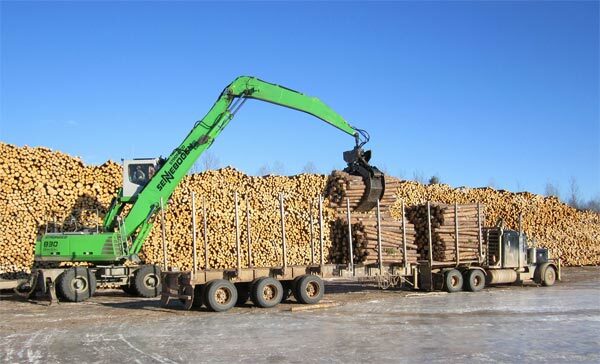 By stacking the piles even a few feet higher, Fornebu can get the most use out of its 15 acre (6 hectare) lumber yard. “The other manufacturer’s machines are good machines, but from a safety, stability and reach standpoint, the SENNEBOGEN is far superior,” says Godin. “With the SENNEBOGEN 830 M-T, Fornebu has 50% more unloading capacity. That means 50% faster unloading and 100% happier truckers,” says Godin. Godin also noted that the 830 M-T material handler has “a lot more power,” partially due to its dual transmissions. Operators use the 830 M-T to haul a trailer filled with 22 cords of wood over muddy, uneven ground. “It’s easier to haul wood with the new SENNEBOGEN. When we go up the hill, we can feel the difference. You can even speed up if you want as you go up hill!” he says. The SENNEBOGEN philosophy to empower end-users is a huge advantage for Fornebu. The company provides free training programs for mechanics and familiarization programs for operators in its world-class Training Center in Charlotte, North Carolina. The material handlers are also purpose-built to work with off-the-shelf parts. With two SENNEBOGEN material handlers in the yard, Godin has found keeping the pace (and sleeping) to be much easier.